An old one I'm afraid as life has been really really mad. I'm revisiting an old idea and developing it. Some time ago I did a couple of abstract paintings based on the idea of the Harlequin costume from the Comedia del Arte. One shown below is a 30x40 inch canvas. The one above was also trying out my new Sailor Flude pen - which I really like. It's odd curved tip allows me to draw with the pen quite upright or tip it to make broad marks- the thickness of the lines in the sketch above were all done with the one pen, just angled differently. This time I'm looking at Columbine as well - her costume sometimes echoed the pattern of Harlequin's. Costumes - the Comedia company were travelling players - costumes were often ragged and patched, which was the origin of the diamond pattern now seen as traditionally Harlequin. I have got hooked on the raggedness as well as the patterns of patches in the current series.. 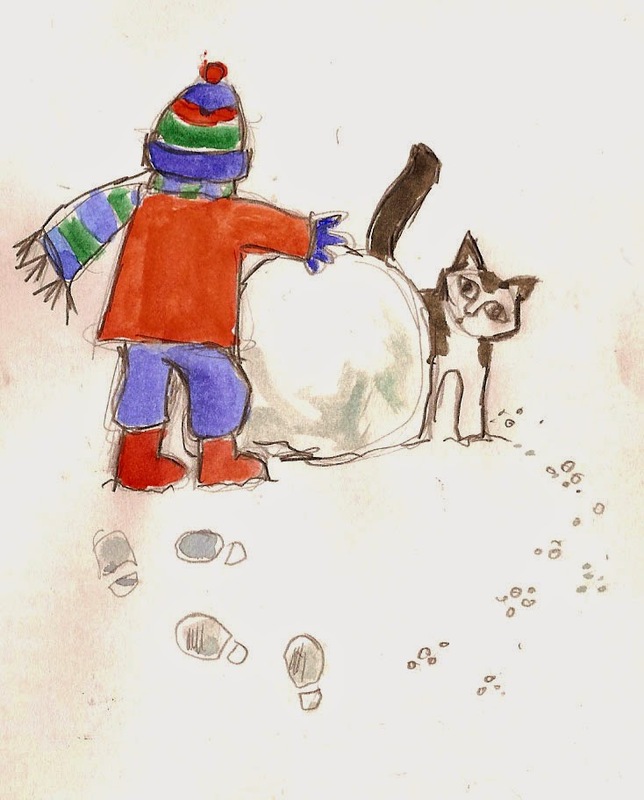 I was asked to provide an image using Inktense for Derwent, who were revamping their website. It's now live. :>) .... and they forgot to add my name! It's about flowers rather than being any particular flower. There are elements of poppies and Queen Anne's Lace and heaven knows what else in there. Purely imaginary. It's based on a large canvas I did some time ago. Inktense is one of my favourite Derwent products (alongside the XL tinted graphite and tinted charcoal). I love the vibrancy and yet it is also possible to mix them to obtain subtle colours. 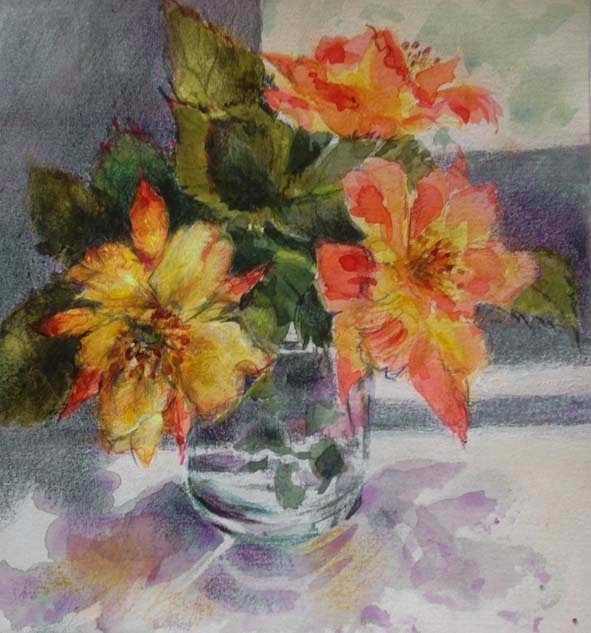 They are more transparent and luminous than ordinary watercolour pencils and because they dry waterproof I can build glazes and work over layers below as in my image that they used. I use the pencils and the blocks. 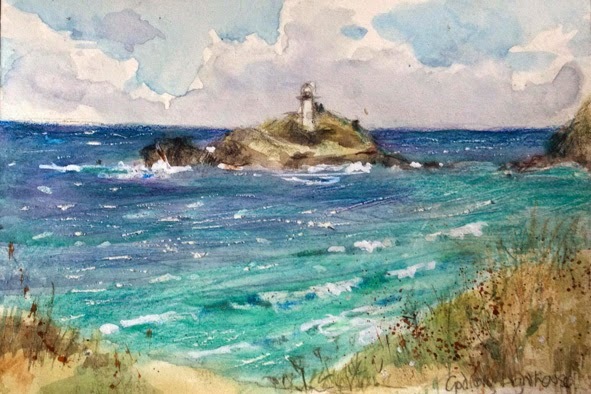 Another plein air sketch from the recent trip down to Cornwall. Moody days are so much more interesting to paint sometimes than blue skies. 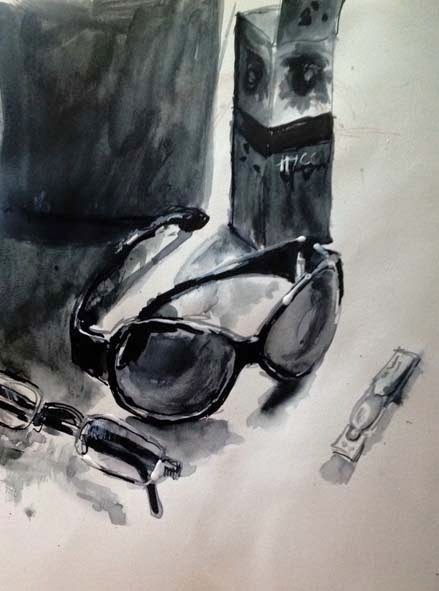 Done in the S&B sketchbook with watercolours and Derwent tinted charcoal pencil, which is water soluble. I wish I was there now! 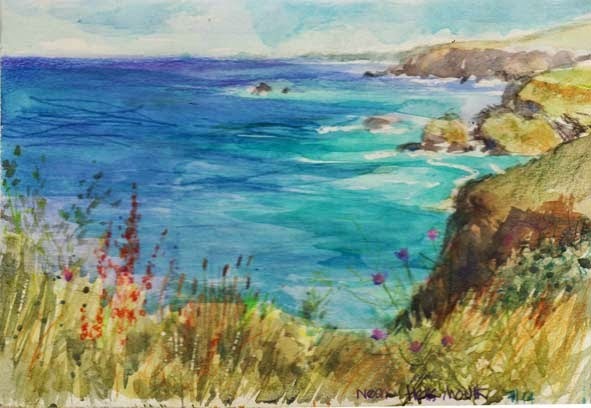 There is a grass that grows on the clifftops that goes the most beautiful scarlet at this time of year, I'd so like to be sketching there. When these kind of pens for digital tablets came out they were very very expensive and I didn't feel I could justify one. The Dagi pen has come down to an affordable, justifiable price now and I've been playing, seeing how good it is. Mine is a pretty frosted green :>) It's good! I don't know how robust it will be, time will tell. The plastic disc is there presumably to protect the screen, it comes with a few spares, obviously it is easily damaged. The fine point means precise placement. For accuracy in placement of the tip of the pen when drawing on the tablet, it feels just like normal pen/pencils - you can see precisely where you are placing the tip, unlike the normal rubber tipped stylus. 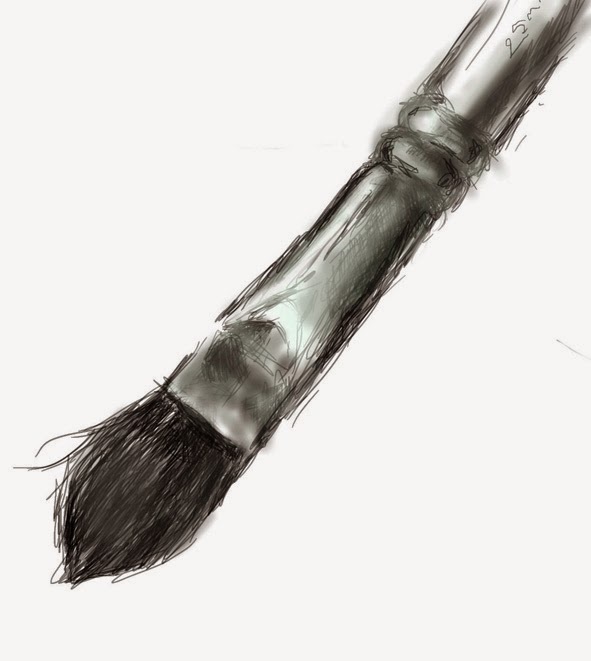 The paintbrush was drawn on a single layer, flipping between pen and brush and several shades of grey. Untitled as yet - any ideas? I went to an artist's talk last week and she demonstrated how she did her large scale flower paintings. A good talk but I wasn't keen on her methods or results - too methodical and literal for me, involving tracing photographs and carefully colouring in between the lines with layers of the same colour - but it did make me feel like doing another abstracted flower painting and just playing with colour. So instead of working on the seascapes, I did this. It's still subject to change! there may be updates. 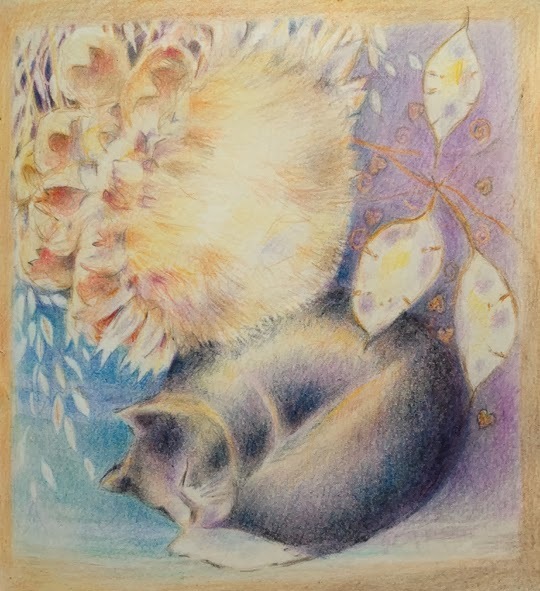 It's based loosely on a slightly smaller pastel I did some years back. That was loosely based on some beautiful bearded iris in the garden of a house in France we'd stayed in. I do love the changing light and the different colours and moods. I could paint along here again and again through the seasons and each image would be different. Flowers, sea colour, skies always new. There was a massive cliff fall at Hells Mouth that I didn't know about until I got home - thankfully! Video here - do watch, it gives an idea of the scale and drama. 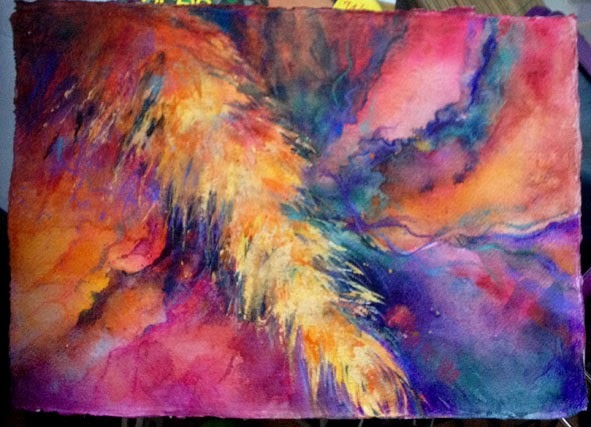 I ended up mostly using my watercolours on this trip for some reason, though I had taken oils and used them a little. I made the decision early on to mainly work in the S&B sketchbook and fill it, which I did :>) rather than try to complete larger works in changing light. 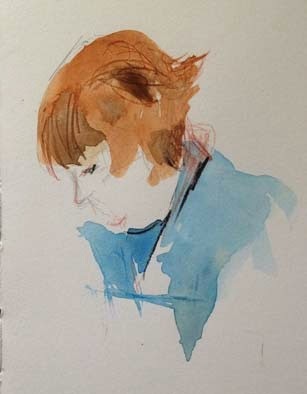 I can work from these sketches at home to produce the larger works, with time to consider format/medium etc at leisure. 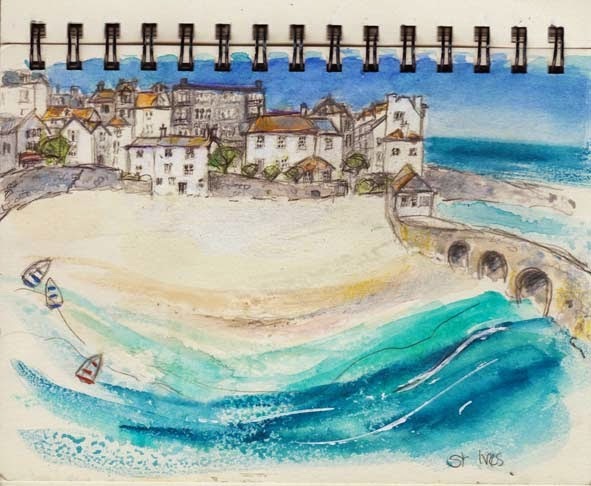 St Ives. An illustrational one as a workout for a commission. I need to do a large one of this beach for my daughter - a very overdue Christmas present! Keeping track of those buildings and trying to distort it a little to make it wrap around was not the simplest! The big version won't be identical as it will evolve a life of its own though it will be similar - but she wants the family on the beach 'recognisable and flattering of all of them', while showing all the buildings etc .....!!! No pressure then. From Gwithian Towans. Watercolour plein air sketch. A cloudy day, looking across the estuary. That's the tip of St Ives just showing across the bay. Done mainly in watercolour with a touch of white gouache and some Derwent tinted charcoal pencils. Sometimes not-such-good-weather is more interesting to paint. 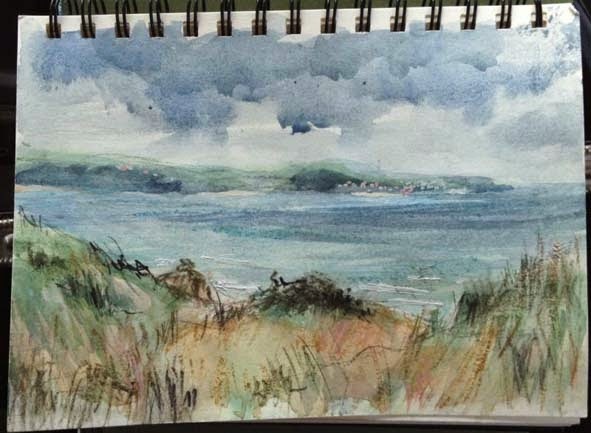 A chance to sketch fairly intensively on a trip to Cornwall. Happy. I was feeling very rusty, particularly with oils as life has been hectic and I haven't had much time lately for plein air sketching. There was plenty of passing cloud and the day was windy, the sea intensely blue. This is a corner of Cornwall I wasn't familiar with, so it was lovely to discover new places. There were so many beautiful spots to paint within a very small distance from where we were staying. 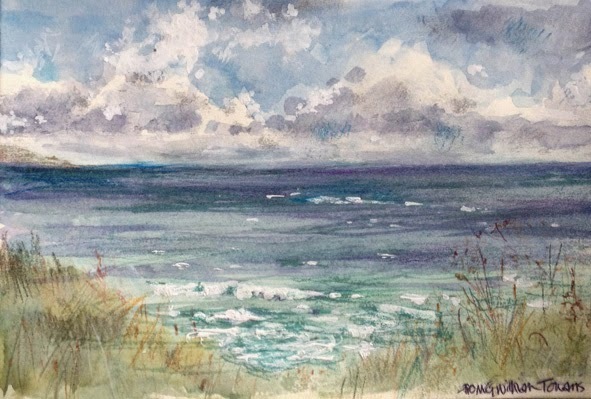 I was painting from the Towans Cornish for dunes - most of the coast has cliffs but being on an estuary (St Ives is across the bay), there is a large area of high, grassy, shrub and flower covered dunes. the highest in Europe apparently. As I said, I wasn't happy with the background foliage (here) - so today I used it as an example of editing/adjusting for my class. I won't finish the foreground off, it's still just a sketch but I was able to regain the highlights with gouache and intensify some darks, simplifying both but keeping the complexity of the foliage. 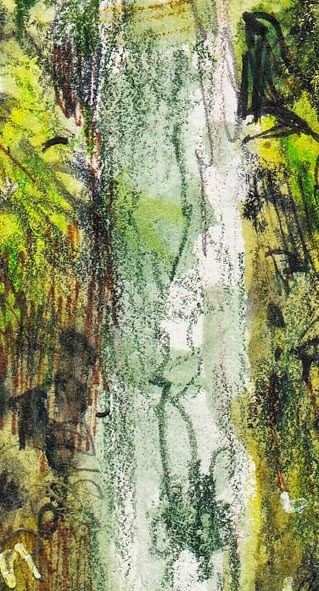 I sketched for a short while in Swithland Woods yesterday. 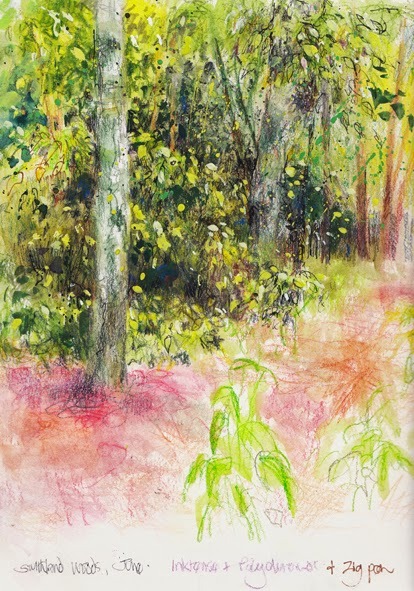 I'd taken my Inktense pencils - and lovely as they are I really really felt the need for oil paints to cope with dappled light and the ability to put back light over dark. I'll have to get back there with my oils. The sketch is unfinished because the background leaves got overworked and fussy as I tried to get the deep shade and brightly lit flashes of sunlit leaves - and the light changed dramatically, making the trees that had interesting light on them a few minutes before, simply silhouettes. It would have spread further over onto the right hand page. Woods are rather like seascapes though, where you have to work fast. Oil paint would have let me do it in the time and with simple direct marks. Pencil is so much slower even though this was a very quick sketch. This was a challenge to myeself to do some blowsy roses, strongly backlit by the bright day outside, creating deep shadows on leaves and window frame (which I simplified to abstract geometric shapes). Flowers aren't something I do very often. They are climbing masquerade roses that I remember buying for £1.60 as a sickly little plant a few years back, that have now spread yards along a fence and flower and flower. They start out yellow and gradually the red creeps in and takes over as the flowers open. I've been neglecting my blog lately. A mixture of a Mount Everest of marking and paperwork to do :>( and having had laser eye surgery.............. and being able to see without glasses (except for reading small print). :>) Yay!!!!!! I liked the backlit arrangement of clutter relevant to the surgery on my desk after I'd used the eye drops and decided to draw it. It started off with some Herbin Gris Nuage but it didn't go dark enough for the shadows so I added FW acrylic Paynes grey ink and touch of their white ink to regain some highlights ,,,, then a small touch of Tombow pen. The stick I used was a handle from a broken paintbrush, sharpened with a pencil sharpener. I think I prefer the freer marks of twigs but it worked very well. There was of course also water and a paintbrush for creating washes of paler ink. 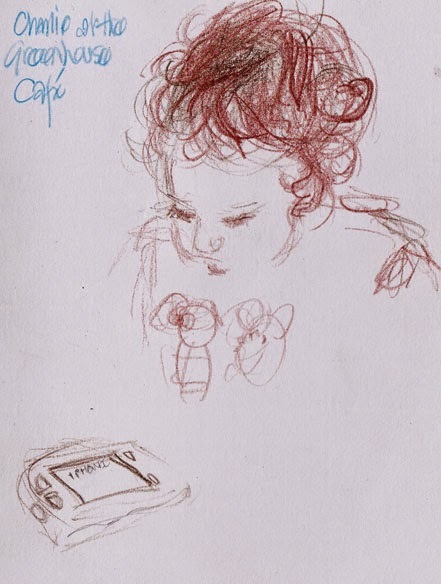 A quick sketch of my youngest grandson, constantly moving, playing with an iphone. He disappeared to the play area of the cafe before I drew his arms. Done with 2 brown coloured pencils in a small Derwent journal. (2 because he insisted on having the first one to do some drawing himself, so I had to find another). Drawing active children is so difficult! they just moved constantly. The 2 below of my slightly older grandchildren were very messy! I attempted to catch the huge brown eyes of elder grandson and the mop of fair hair my grandaughter was trying to see through to draw and the soft curls of the 2 boys. Of Flowers. Mixed media on canvas. 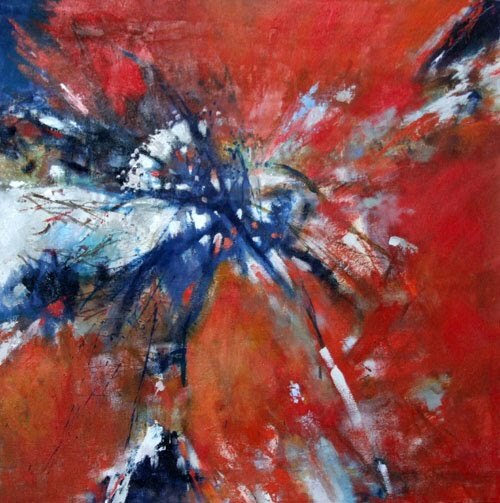 The image below is a part of avariation on this canvas which you can read about here - each version exploits the mark making potential of the medium used. The flower is purely imaginary and abstracted. It's about flowers rather than being a flower. 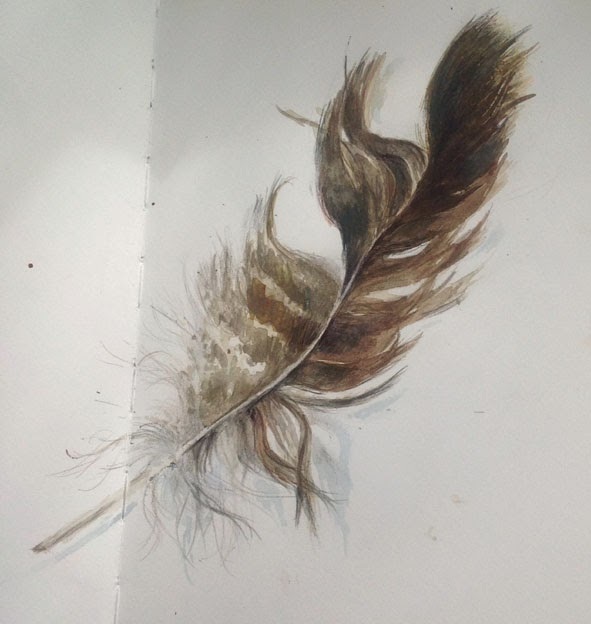 A ragged feather in a mix of watercolour, coloured pencil, Derwent tinted graphite pencils and biro. I can't show the work I've been busy with yet. And paperwork and marking has been taking up a lot of time too. So many plans and ideas and so little time and energy! Still looking at the items on the shelf above the tv but moving them around on paper, rearranging and looking at pattern and colour. They aren't in the positions I've drawn them in at all and I've simply used the colour of the vase, though lightening it, not wanting the vase itself explained. The same with the wheat and hearts patterns. Warm light from the lamp and the cool lavender shades are observed so that the whole thing hangs together.